I’m excited about this week’s blogging tips guest post. It’s about a topic that I’ve been wanting to learn more about for a long time. Since I don’t know a whole lot about it myself, it’s awesome that a guest writer offered to write about it. Anyways, I won’t waste any more of your time with my rambling. A year ago, I decided to get started with a newsletter. It was time. After blogging for a few years and getting settled in the routine of posting and getting established in Google, I wanted to further look at monetization through a newsletter. They say the money is in the list and that’s true for every businesses. If you can reach your customer directly, you have better chance of monetizing them. Setting up my newsletter is the first up front planning I happen to have done with my blog. I started blogging in 2010 and just dove right in with limited research…I started with Blogger and moved to Word Press a year later and continued to learned over the past years. With my newsletter though, I learned first and I put a plan in place. It’s true that you want to start early to grow your list but you need committed users and not just anyone that will unsubscribe later. I’ll cover quality subscribers later. It’s true that there is a lot of free content on the internet, but there is always a benefit in accelerating the searching and providing content in an organized manner. When I promote older posts, they are organized in a topic with multiple posts supporting it. For example, if I discuss the topic of DRIP, I will bring in many supportive articles that can be read. The follow up becomes a source of traffic to the blog letting Google know those pages are still active and pertinent. This is a slow and organic process obviously. It’s just like compounding interest, it grows bigger and bigger over time. Initially, the slow traffic lets Google know it’s active and over time it will look pertinent and if it gets promoted in searches it might rise in PR. I am speculating a little here, but I am sure it can’t hurt. The traffic increases the chances of a reader clicking on ads or an affiliate which increases my potential for monetization. If your follow up is set up around content that is pertinent for the reader, they will make it on your site and that’s what you want. You can then monetize from the newsletter itself based on the affiliates that are pertinent as well. Your newsletter layout is important here. I am not very direct in promoting products, it’s usually secondary to my newsletter content but it’s always present. Some newsletter are very specific about pushing products and that’s a third option. I do have plans to achieve this but I want to insert them in my follow ups at particular points when I know they are committed. 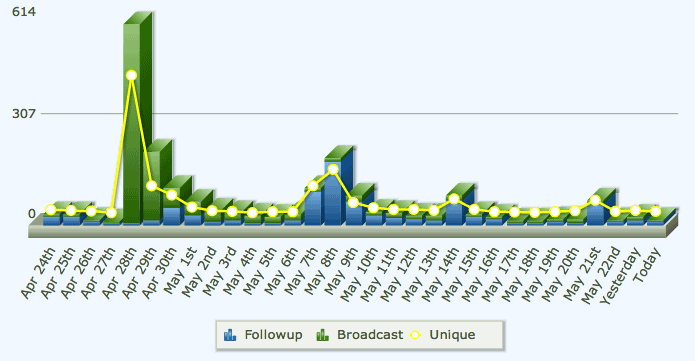 Below is a graph showing the traffic to my site generated by the newsletter. Over time, it grows with the subscribers as there is always a follow up for them. With my goals in place, I set out to work on acquisition, retention and monetization. Those are key principles online that you really want to focus on for any business. You need to build your subscriber list. There are many ways to promote them on your blog and it’s for you to test them. Some have popups and some don’t. I hate the pop ups and I have never tested them either. If they work, great but I would like to understand if they are quality subscribers first. With Aweber, you pay for every subscriber and it’s important to have quality subscribers. Don’t cry when they leave as you are saving money. They probably weren’t going to make you money either so don’t worry too much about losing them. Aweber lets you run split test to assess which form works better and I personally use the split test to assess which location works better. Believe it or not, but the bottom of post works the best for me. Not the sidebar and that’s prime real estate on a blog that we can use for other monetization. Below is what my subscriber growth looks like. 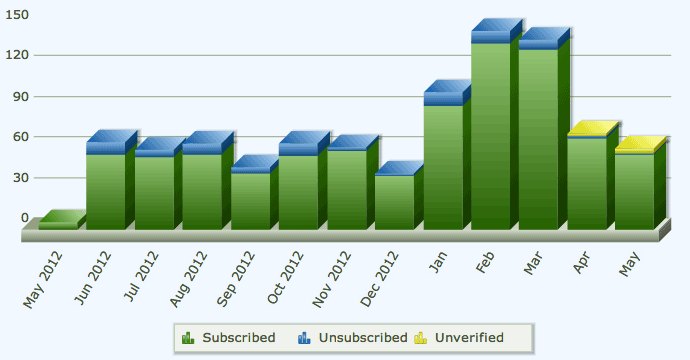 A spike in traffic usually leads to a spike in registration as you can see for January, February and March. In the end, it’s all a number’s game. 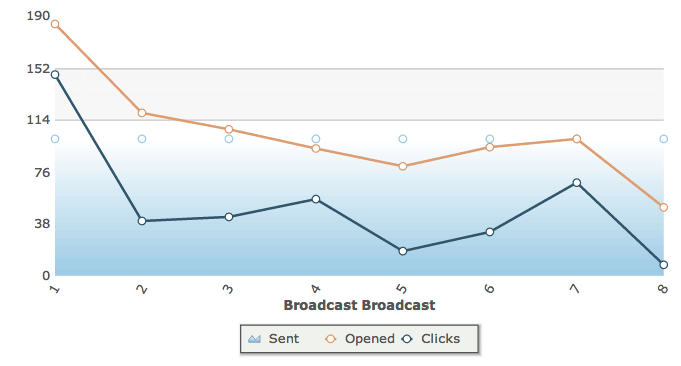 X percentage of our traffic will subscribed and Y percentage of your newsletter will engage and monetize. The trick with a newsletter is to not be considered spam. I hate spam. You hate spam. Everyone hate spam and it doesn’t take long we unsubscribe. It’s the same for your readers and that’s why I took time to plan my follow ups with pertinent content and not just some quick affiliate push. This is where you start interacting with your subscribers. You have 2 ways to achieve that; Follow Ups and Broadcasts. Follow Ups are amazing but you should have a plan and it takes time to set up. Follow ups were included as part of my planning. I had a number of follow ups in place when I launch my newsletter and I currently have a total of one year’s worth of follow ups. I have 10 in total usually sent every 25 days except for the first 2. I find it’s not too often and it’s within a month. That way, my readers hear from me twice a month. It’s all automated and the topics are timeless and always relevant. Follow Ups are sent only on Tuesday, Wednesday and Thursday except for the first one. Broadcasts are sent only on Sunday and Monday. As you can see, there is no overlap for either of them. My broadcast is also sent at regular interval at the beginning of the month. It’s a pattern my subscribers get familiar with and they won’t feel it’s a random spam email. Now that you have their attention and trust. You can look at monetization by offering pertinent products that can help them. There are many ways to offer affiliate products and it’s up to you to know what works. If you ever write a book, the newsletter will go a long way to monetize it. Making your subscribers feel special by offering a discount will also reward them. Below is my follow up activity in percentage. I aim for a high open rate initially. If they don’t open your email, how will they click on content. Follow up number 5 and 8 had a low open rate and the solution was to make the title more interesting and actionable. It worked for number 5 and I have seen results for number 8. As for the clicks, it’s all in the content. Unlike your blog where you write for readers with a focus on Google, your newsletter is about your readers. A popular topic on your site in the eye of Google doesn’t mean it’s popular with your subscribers. Number 5 and 8 are suffering from that. I like the topics and I think it’s worth it and pertinent but according to my subscribers, it’s not enough for them to take action. Often time, it’s all in the wording and how you engage your readers to take action. My broadcasts have an 80% click rate and many have over 100% click rate. The newsletter has been great for my blog as it has created a third source of traffic to my blog after searches and referral. As my subscribers grow, the traffic it generates can be bigger than my referrals. The more traffic to my pillar posts the better it is with Google and it creates a self feeding cycle much stronger than referrals. I do subscribe to a number of newsletter to see what others do and I recommend it. You can see what you like and what you don’t like. I decided to give my newsletter a professional look and format with consistent content on it. It’s pretty standard with professional newsletter and it has worked well for me. I will leave you with the choice to subscribe and see for yourself or not 🙂 The link is in my byline and I strongly recommend Aweber. Author Bio: The Passive Income Earner is a DIY investor and software engineer by trade. He has a passion for building a retirement portfolio to retire from the income it generates. Subscribe to my newsletter for more unique content on investing. Thanks for the thorough review of Aweber. I have been meaning to get started on this for some time but just have struggled to find the time to get started on it. It’s definitely on my radar of things to get done in the near future. I hadn’t thought about that angle before. When people talk about lists and monetization, they usually talk about pitching to your subscribers. I hate when people do that to me. It is why I don’t subscribe to many lists and why I unsubscribed from Ramit’s list even though it contains a lot of great information. I felt the same way but I saw it as an extension of my blog. I felt I had great content and I wanted to surface it. It’s another way to not just let Google control your traffic 🙂 The options were to convert the content into eBooks or write a formal book (maybe someday) but the easiest way was to engage them with that content. So far, it has been working well and I know another friend blogger has put it in place and it’s working well for him too. That way, the great, but older content, is still being used and it can lead to monetization without having to push products to people. hm,.. I´m amazed.. I´ve never thought much of the importance of newsletters and how it might impact your traffic and more. Perhaps I´ll work on this during the summer! When they say the money is in the list, we often mistake that for pushing products and affiliates but the list can be much more! I have found that the list is a lot more picky about topic than what Google perceives as your primary topics. It’s something you will find out through your open and click rates. My favorite part of Aweber is sending content to readers that I wouldn’t use as a blog post. This could be a rough idea or just something that isn’t fit for my blog. 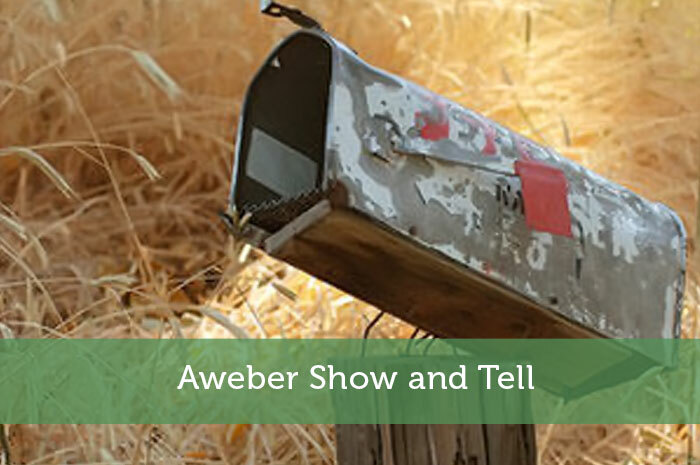 I’ve wanting to set an email list with Aweber for some time now but haven’t had the time. Right now I’m currently just using Feedburner but I plan put together some sort of opt in offer to give away as part of signing up to my list as well. One problem I have though is my site covers so many different topics and I don’t want people to unsubscribe or get annoyed because the content isn’t as targeted anymore. Is their any suggestions you have for dealing with a site like this? Great info! I’ve been thinking about setting up an email marketing drip for my blog. I have been toying with the idea of starting a newsletter, but it’s hard to know which service to go with. I use AWeber for one of my clients because I send out his newsletter for him every month, and he really likes it a lot. I’ve considered it, but haven’t decided if it is worth the cost for me right now. I’ve heard a lot of good things about moving to aweber. Your logic is sound, I confess it’s just laziness keeping me from making the jump though! Great info here. I had very little idea of how the whole newsletter thing worked before, so I appreciate the info – thank you! Still using your WordPress plugins recommendations! Great tips.